On an overcast day in 1996, surrounded by a mob of raucous, screeching denizens, David Letterman stood atop San Francisco’s Filbert Street. Beside him, stood a giant, refrigerator-sized crate of watermelons; below him, one of the city’s steepest descents wearily loomed. San Francisco’s hills have long-since attracted such shenanigans. But in some of the city’s hillier neighborhoods, any attempt at mobile activity — driving, walking, running, cycling — can be equally entertaining. In the words of poet Gary Snyder, one is “never out of sight of [these] wild hills,” especially since the city is only 47.3 square miles. They are as synonymous with San Francisco’s landscape as Karl the Fog and hippy counterculture. The city’s copious slopes are no mystery, but where do the steepest of them lie? Let’s take a look. While there are no laws regulating maximum grade, the steepness of a road is governed by engineering standards and ultimately depends on the natural terrain on which it is built. Roads in a flat place like Minnesota will generally be of a lower grade than those in, say, mountainous Boulder, Colorado. For reference, almost all interstate highways in the U.S. have less than a 5% grade; the vast majority of local countryside roads don’t exceed 12%, and 15% is considered by many urban planners to be the maximum preferable grade for pedestrians and drivers. According to the Guinness Book of World Records, the steepest residential road in the world is Dunedan, New Zealand’s Baldwin Street, which boasts an average grade of 35% — though Pittsburgh has contested that its Canton Avenue has an average grade of 37%. How does San Francisco stack up? In late 2009, Stephen Von Worley, a local datasmith, set out on a quest to find San Francisco's steepest paved public streets. It was long-claimed that Filbert Street (particularly the section between Leavenworth and Hyde, where Letterman let his watermelon loose) was the steepest in the city, at a 31% grade. In previous efforts to quantify the city’s most ridiculous inclines, Filbert always reigned supreme — but these lists were biased toward San Francisco’s touristy, well-trodden neighborhoods (North Beach, Chinatown), and many areas were largely neglected. Von Worley made it his mission to explore the backstreets. Eventually, after some urban exploring and scary car rides, he curated a list of the steepest streets he could find. For this list, he included all paved roads, regardless of length: a couple of them were essentially glorified driveways; others were sidewalk-only streets, where cars were not allowed. Filbert Street, which was previously thought to contain the steepest incline in San Francisco, barely cracks the top 10 here. Sections of three other streets — Broderick (Pacific Heights), Romolo (North Beach), and Prentiss (Bernal Heights) — all match the pitch of New Zealand’s world-record road. Though, like Bradford, all of these grades are rather short-lived, averaging 40 feet in length. In total, we found 25 streets that contained at least a 30-foot stretch of 25% grade. This is a tremendous incline: with no friction and no air resistance, the average cyclist would use around 440 Watts of power to climb it. To put that into perspective, this year’s Tour de France winner, Chris Froome, expended an average of 414 Watts during the climb of La Pierre-Saint-Martin (though admittedly, this was a much longer climb). Still, to make it up some of San Francisco’s inclines requires a greater maximum power output than a world-class cyclist. Many, like Romolo Street above, were deemed too steep for pedestrians to walk up, and were fitted with staircases in lieu of sidewalks. 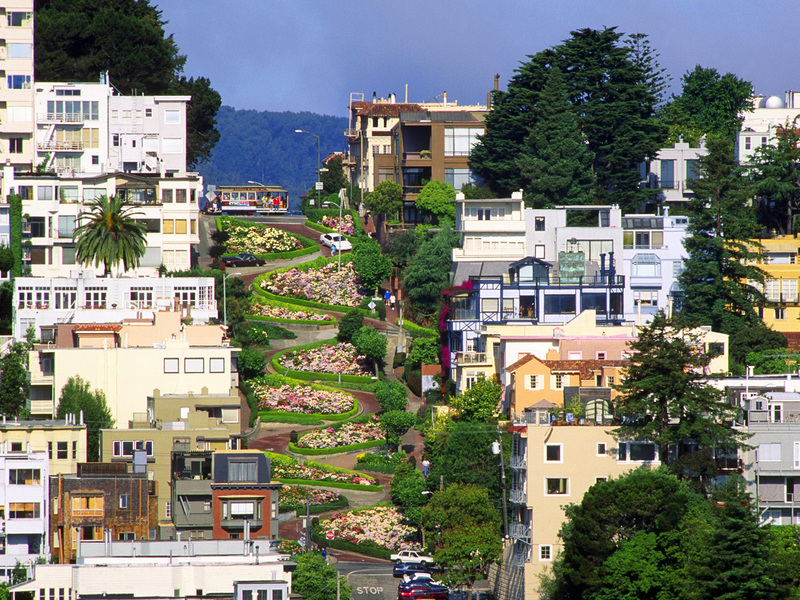 Russian Hill, which closely trails, is home to the famous Lombard Street, dubbed the “crookedest street in the world” due to its eight sharp switchbacks. In 1922, Lombard was constructed as a straight, cobblestone street with a 27% grade, but with the rise of the automobile, residents complained that it was far too steep to drive up. Clyde Healy, a young city engineer, soon proposed and implemented the curved design we see today, effectively reducing the maximum grade to 16%. At 928 feet, Mount Davidson is the city’s highest point of elevation, yet not a single one of the city’s steepest inclines is located in the surrounding neighborhoods (Miraloma Park, Westwood Highlands and Sherwood Forest). The same is true of Twin Peaks (925 feet): no street in Twin Peaks or Diamond Heights that we came across exceeds a 25% grade. In some areas, the city’s natural geography seems to have little impact on the pitches of the streets. This may be a result of crafty engineering: the switchbacks leading to the peak are long and winding, and at no point is the pitch greater than 15%. Only one known person has succeeded in walking every single one of the city’s 2,612 streets. Dubbed the “S.F. Walking Man,” Tom Graham spent the better part of 500 hours over a 7-year period counting cul-de-sacs, dead-ends, and unmarked alley ways, covering more than 1,500 miles along the way. He did not measure, or compile a list of, the city's steepest streets. Unfortunately, we didn’t have time to replicate his feat, and as such, the list included here can only be considered a good starting point for mapping San Francisco’s steepest streets. As we didn’t attempt an out-all, exhaustive survey, we can’t claim with certainty that our results are comprehensive. But what we do know is that this city contains slopes capable of bringing a 27-year-old writer on a bicycle to tears. Slopes that rise at angles far beyond what city engineers consider ideal, or even safe. Slopes that, in proper San Francisco fashion, make one question what is possible. Our next post takes a look at which dog breeds get adopted most often and which ones don't. To get notified when we post it → join our email list.